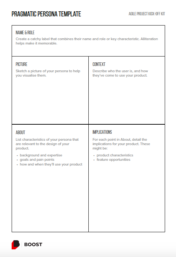 This Pragmatic Personas template lets you quickly and collaboratively turn existing customer insights into memorable characters for whom the team can design the product. Pragmatic Personas are a valuable tool in the Agile Project Kick-off Kit. They help the whole team understand whose lives you’re trying to improve and how. Because of its focus on the customer, this is one of the discovery workshop exercises where it helps to bring in stakeholders who really know your customers. Call centre, front-of-house and sales staff deal with customers every day, and can also often recruit representative customers to attend the session. Marketing, user research or analytics experts are also good options. At Boost we stick quite closely to the template Jeff Patton outlined in his talk and article on Pragmatic Personas. The personas are pragmatic because they’re a lightweight way of getting the job done. They do it quickly, collaboratively and using the knowledge about your customers that you have to hand. And the end result is something the team can easily refer to as they work. For example, the project might have access to swathes of market research, analytics or user testing results. The team working on the project aren’t going to refer to this trove on a day to day basis though. Pragmatic Personas distil this data into something meaningful, accessible and actionable. On the other hand, you may have no existing research. You do have a product owner and, hopefully, stakeholders who thoroughly understand the customers, and perhaps some actual customers too. You should also have a development team with experience delivering what different types of customers need. Pragmatic Personas let you use this combined expertise to make educated assumptions about your various customer types and their wants and needs. Download the template (PDF, 166KB). Download the blank template (PDF, 150KB). Pass around the template or put up an example on the whiteboard. Describe what’s needed in each part of the template. Brainstorm some key customer types (they could be internal or external customers). Try to keep to no more than three personas. When we ask clients who they think will use the product we’re often told “everyone in the phonebook”. It’s important though to characterise and prioritise your personas. Think about which customer groups will get the biggest benefit from what we’re going to build. You can print out the blank template and get them to fill that in. We just use an A4 sheet because otherwise you can get too much information and end up with something that nobody will refer to later. 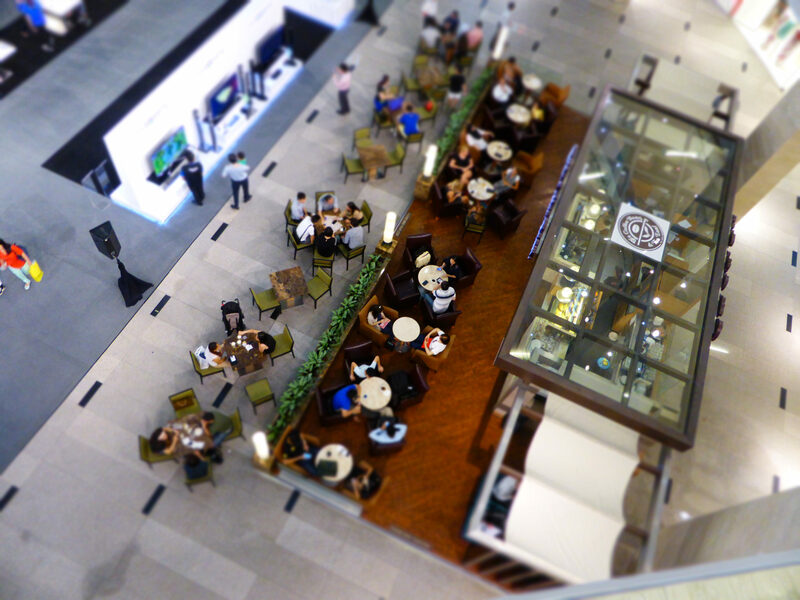 If you’re doing multiple personas then split into groups and tackle one persona each. Once they’re done, give each group a couple of minutes to present their persona to the workshop. Then capture the personas and make them visible so the team and stakeholders can refer to them later. As a group, rank the personas in order of importance. A good way of thinking about this is to consider who your most valuable customers are and who will get most benefit from the product. This prioritisation is important because you’ll be focusing your development effort on the top persona. For example, these priorities can flow through to your Story Mapping. Tag each persona with a different coloured sticky dot. Once you’ve written your User Stories you can decide which persona they benefit most and add that dot to the story card. Here are some tips on how to fill in each section of the pragmatic personas template. Create a catchy label that combines their name and role or key characteristic. Alliteration helps make it memorable. For example, if the product you are developing is sliced bread, you might target two personas: Tony Toastmaker and Sally the Sandwich Addict. The names give you a quick, evocative reference point for later conversations. Draw a picture of your persona to help you visualise them. Encourage the team to get creative. You might find people start out anxious about their artistic talent but once they get going they tend to have fun. And the act of imagining what a persona looks like helps bring it to life. In the past we have used stock photos. While they gave the finished product a glossy sheen we found that their bland, generic look prevented the persona from sticking in the mind. Describe who the user is, and how they’ve come to use your product. You could also think of this as the situation or scenario that leads them to your product. We’ve found people often want to stuff the Context box full of information better covered in About. Keep the Context section down to a few bullet points. attempting to master the art of preparing toast. looking for dishes needing minimal preparation time due to being time-poor (Tony prioritises screen-based entertainment, sleep and scratching himself). For each point in About, detail the implications for your product. What attributes will the product have as a result? Watch out if you start listing features. This runs the risk of going into too much detail. Pragmatic Personas are a powerful tool for putting the customer at heart of your product. You get to convert an abstract idea into a character whose traits you know and whose needs you understand. Where once you had a generic user, you now have a human face, made up but meaningful. Read about the persona we developed for our Scrummaker project.